The pattern seen at left is much like the pattern reflected in Solomon's Temple, as shown to King David, and built by King Solomon, son of David. The Great Pyramids were also constructed depicting this very same pattern, but constructed in reverse - suggesting a narrow path into the Heavens, with a wide expanse on Earth for the training ground. The Pyramids were built by the Anunnaki sometime before their departure of 2400 BCE. I leave scientific dates, calclations, and measurements to experts in that realm, my calling is that of the 'UNVEILING' - which is to shed Light into a darkened world. Folks can either take it or leave it - at least this knowledge is being presented to them at this time. 'Heaven' is the word for the highest dimension, or plain, of known existence. 'Hell' is the word for the harsh training ground, such as humans experience while Earth-bound. This is the place where humans grow spiritually, and as they progress in their evolutionary learning they [hopefully] are reaching a higher degree of perfection. To this training ground many come as teachers, showing others the prossess of Ascension. Most everyone has heard of the pearly gates - they are sometimes referred to as the 'two golden cherubim' that adorn the 'seat' of the Great Spirit. These two celestial bodies stand as giant pillars to the entrance of Heaven's Gate - they are full of literal light, and are not unlike our Sun. 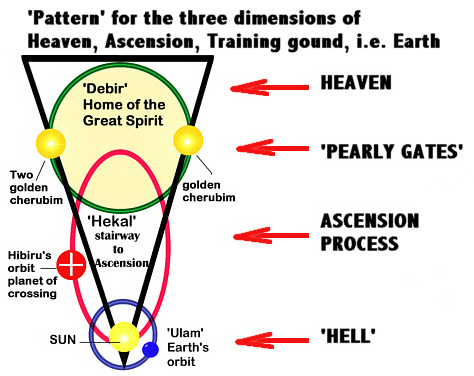 The middle area, referred to as the 'stairway to Heaven' is reflected in the orbit of planet 'Hibiru' - the planet of 'crossing'. This planet is home to the Elohiym godhead, and to the planet's ordinary citizens, called Anunnaki. It was the Elohiym who designed different races of humans here on Earth - not the Great Spirit. The Elohiym created various species and races by utilizing that which was already available - much like our scientists experiment today with DNA. Descendants of the Elohiym and Anunnaki still inhabit the Earth and were once called the Hebrew. For more info, see article on Ascension. Our solar system, of which the Earth belongs, is a harsh training ground for the cultivation of the Spirit. Our purpose here on Earth is not to serve the Anunnaki, Elohiym, or any gods, but rather, to grow, progress, and strive to Ascend into the realm of Heaven where the Ultimate in knowledge and wisdom resides - that of the Great Spirit - Creator of all things.